In that case, if a creative streak does not allow you to wear consumer goods and want to decorate t-shirt prints of their own creation, you can not hurry with the visit to the photo Studio. Much more interesting to paint a shirt with acrylic paints on their own. Acrylic for such work is the best option. It penetrates well into the fabric, long retains its properties, has a huge color palette, and in addition, many effects. There are acrylic, glow in the dark pearlescent paint and paint with a matte effect, apply some materials, you can achieve interesting effect of cracking of the upper layer of paint while preserving the lower, contrast, intact. When you buy acrylic you need to pay attention to what fabric it is intended and to choose the corresponding composition t-shirt. Brushes will need a few depending on the complexity of the design. It is best to take the brushes with synthetic bristles - they are less fade and the paint to wash them is also easier. 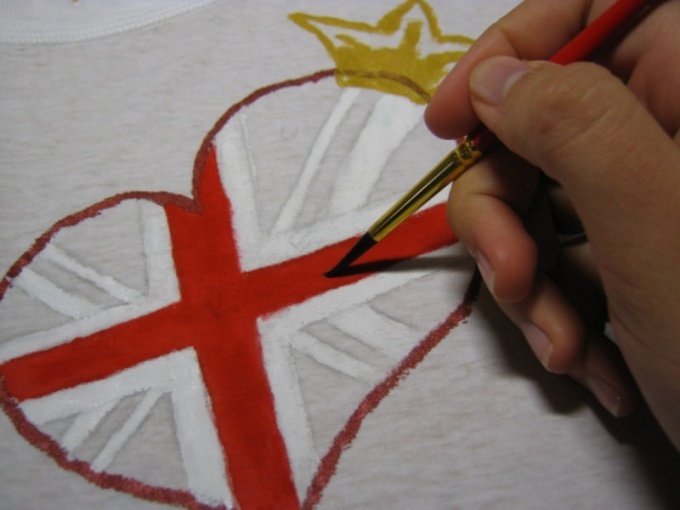 Once selected paints, brushes, drawing and t-shirt, you can begin the process of painting. Between the front and back of the shirt it is better to lay a layer of cardboard or Newspapers on the cardboard to secure the fabric much easier. To secure the fabric not necessarily, but preferably, as in the process of drawing it or start to fidget and pattern can be shifted. Figure easier just to move a soft pencil and then paint. In that case, if in the process of painting a drop fell in the wrong place, don't worry. To remove this stain is almost impossible now without affecting the main picture, but it is always possible to show imagination and paint a tainted place so that random drop seemed part of the picture. Often, acrylic paints are too thick, making it difficult to work with them. To dilute the acrylic with water you can even if there is no other way. But it will reduce the quality of the paint and later it will wash off with t-shirts. It is best to use thinner for acrylic paints, it is important that it was the same brand as the paint. A coat of paint on the fabric must be even and not thick, otherwise he can not gain a foothold. It is always better to do 2-3 thin layers than one thick that's thinner. The better the paint will impregnate the fabric, the better and more durable will be the pattern. When mixing colors it is important to do this as quickly as possible, so the colors will be brighter. The pattern on the shirt should be allowed to dry not less than 24 hours. You can then start pinning. Fix drawing iron, paving it through cheesecloth or cotton cloth on the maximum tissue temperature. Washing and any water is allowed after 48 hours after posting. When washing, use only mild detergent, water temperature should not exceed 30-40 degrees. Long spin at high speed can not be used, painted with acrylic on t-shirts washed, pressed and dried as delicate fabrics.